“If I had started to read this I probably wouldn’t continue believing it was probably concocted by some marketing guru but it’s real enough and hopefully not too boring. I am an Electronic Design Engineer involved in chip design for mobile phones. It is a job that can be quite stressful although it is one I quite enjoy doing. Another important fact is I am on the wrong side of 50. I was quite active in sports like squash and tennis and continue to play although less frequently now. In order to keep fit to play I try to run about three miles about twice a week on a treadmill and have had this regime for well over ten years. About six months ago I had a blood test with my local GP to test cholesterol levels. I thought it was unnecessary as I considered myself to be fit and healthy and by inference felt my cholesterol levels were bound to be good. As you’ve already guessed they weren’t. The simple explanation I was given by the nurse was that my ratio of good to bad cholesterol was far too low. I didn’t know about good and bad cholesterol (or LDL and HDL) then. I was then given a corrective low fat diet plan by my NHS health advisor. I wasn’t pleased to see that the government approved diet food plan from the doctors was stuffed full of salad type food which I particularly dislike. I had been eating ‘healthy’ foods, cereal for breakfast with a good dinner in the evening and no food at lunch to keep my weight down. Fortunately I had heard of Mac-Nutrition at the time and knew of their reputation. I asked the team at Mac-Nutrition for help and they started by analysing my food intake. My result was 52% carbs, 29% protein and only 18% fats. When I saw the results I thought that was rather good as my fat intake was low and in line with what I believed was healthy eating. It was at this point that I received a personalised plan developed by my personal nutritionist… if I am honest when I first read it I thought was particularly unhealthy as it contained a high level of bacon, eggs and cheeses. It was at this stage that I started learning about cholesterol, what foods are actually healthy and the ‘Mac-Nutrition Way’. On my new food plan I ate three rashers of bacon and two fried eggs with tomatoes breakfast (My wife is a good sort who is willing to cook for me early in the morning) – which I very much enjoyed. My concession in the plan was to have a salad for lunch which usually included mackerel and spinach leaves. In the evening I had to have plenty of red meat so two out of three wasn’t bad. And then a couple of times a week at the end of the day, I could even have some plain chocolate (I didn’t mention the tasty mid-afternoon protein shakes and the mid-morning protein bars). There were a few sacrifices however – no beer, no bread and no cakes. You might think like I did that this plan was nothing short of barking mad but I trusted the team’s advice and gave the plan a shot. The decision was made a lot easier due to the alternative being unthinkable. Although the food plan wasn’t designed to reduce weight, I found that jeans that I had stopped wearing (due to what I had hoped was washing shrinkage) I was able to wear again. I lost about 0.5 stone over the three months although I was actually eating more and never felt hungry. The food plan by the way was designed to give me a fairly even intake of carbs, protein and fat. After a few weeks I felt better and less bloated after eating but this is not a very quantifiable statement. More scientifically I did notice that I could easily climb three flights of stairs without feeling even slightly out of breath. On occasions when I missed a week or more running it was easy to pick up where I left off without getting out of breath towards the end of the run and there was no stiffness the next day. After about three months on the food plan I had the acid test, another cholesterol check. The test showed my overall cholesterol levels had increased slightly, which I initially thought wasn’t good but it turns out the ratio of good to bad cholesterol had improved enormously. 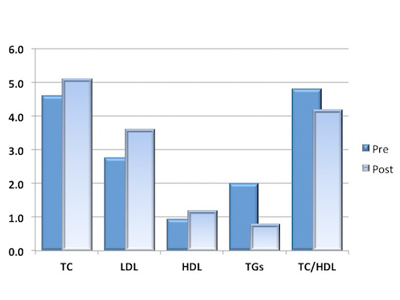 Another marker which I had read up on were triglycerides and these had markedly gone down.